Offering several hundred different lenses, Machine Vision Store likely has the optimal lens for your next project. With C-mount, F-mount, M42, M52, T-mount, V-mount, M12 S-mount, entocentric, telecentric, and macro lenses, we'd like to help. Please contact us if you'd like a recommendation. In general, start by selecting a camera. Once you know the camera's specifications, it’s not hard to select a lens. Next, use the width of the area you need to image to choose the general type of lens. Note there is some overlap in the area various lens types can image. Use a general purpose lens. Our Entocentric Lens Calculator can help you choose an appropriate focal length. Use a macro lens when you need to image a small area. Our Macro Lens Calculator will help you determine the necessary magnification factor. When you will be using the resulting image to measure features, you'll want to use a telecentric lens. Our Telecentric Lens Calculator will calculate the necessary magnification factor. Optical format indicates the image circle of a lens, or the size of an image sensor measured diagonally. The lens's optical format must be at least as large as your camera sensor's format. If the lens has a smaller format, the image corners will be dark. 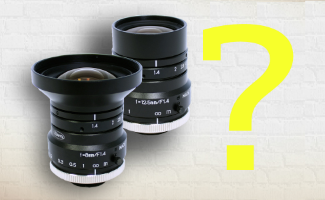 A lot of customers buy 2/3" format lenses for cameras that have 1/2" or smaller format sensors. There is usually little to no difference in price between a 1/2" and 2/3" lens, so 2/3" has become the standard. However, 1" and larger format lenses cost substantially more than 2/3". Why don't optical formats convert from inches to millimeters? You may notice that the optical format of image sensors and lenses are often expressed as a fraction of an inch, such as 1/2" or 2/3". Sensor sizes may also be specified as the diagonal measurement of the sensor, in millimeters. On the Machine Vision Store website, we tend to specify both inches and millimeters. For example, the LSKA211's specifications indicate it can be used with sensors up to 2/3", or 11 mm. But 2/3" is 16.93 mm, not 11 mm! What's up with that? Well, the explanation takes us a ways back into the 20th century. Before there were CCD and CMOS image sensors, there were video camera tubes. Video camera tubes, such as the vidicon tube shown at right, were measured by their outside diameter. A 1" OD tube was said to have an optical format of 1". The portion of the interior of the tube actually sensitive to light was roughly two-thirds the tube's diameter. Returning to our previous example, the LSKA211 has an optical format of 2/3". Multiply 2/3" by the portion of a vidicon tube that senses light (2/3), and we get roughly 11 mm. Today's image sensors have little to do with vacuum tubes, yet this old standard still persists. This makes for some rather strange optical formats. Some years ago, sensors having a diagonal of 9 mm were introduced. Falling between 1/2" (8 mm) and 2/3" (11 mm), they were assigned an optical format of 1/1.8. We now have optical formats of 1/1.2, 1/2.5, and 1/2.3. What a mess. Use the sensor's actual diameter, or the lens's actual image circle, for all calculations. Nearly all lenses are manufactured in Asia or Europe, so the millimeter is the unit of choice. We think its past time for the old optical formats to be discarded in the recycling bin of history. What is meant by 'Lens Mount'? Lens mounts define the interface between a camera and a lens. In machine vision, we are typically only concerned about a mechanical interface, as there is no electrical signal passed directly between the camera and lens. When selecting a lens, you'll want to be sure its mount is compatible with your camera's mount. The good old C-mount is the de facto standard for machine vision. Most cameras and lenses in our catalog are C-mount and, if it meets your needs, you really need not read any further. The C-mount interface has a 1-32 UN2A thread. C-mount cameras have a distance of 17.526 mm between the lens flange and their image sensor. (This distance is often called the "flange focal distance.") Generally, C-mount lenses support image sensors up to about a 1" optical format. However, we do offer some 4/3" format lenses having a C-mount. The CS-mount is typically found on security cameras. It uses the same 1-32 UN2A thread as C-mount, but the flange focal distance is 12.50 mm instead. Note that C-mount lenses can be used on a CS-mount camera by adding a 5 mm extension ring. There are some very cheap CS-mount CCTV-grade lenses on the market. No, we don't mean inexpensive, we mean cheap. The F-mount, made popular by Nikon 35 mm format cameras, has a three-lug bayonet design. With a 44 mm throat, it accommodates larger sensors. The back focal distance is generally 46.5 mm. Since this mount uses springs to tension the lens against the camera body, we do not recommend using F-mount in locations prone to vibration. And what industrial environment doesn't have some vibration? Screw mount lenses, such as the M42, offer better rigidity. The M42 mount is sometimes called Pentax thread mount in the U.S., even though it was first used by Zeiss. It has a 42 mm diameter thread with a 1.0 mm pitch. The flange focal distance is typically about 45.5 mm, although this may vary from one camera model to the next. T2-mount is another screw-type mount. It is similar to the M42 mount, but has a 42 mm diameter thread with 0.75 mm pitch instead. The typical flange focal distance is 55 mm. The Micro Four Thirds ("MFT") system uses a new bayonet-type lens mount with a flange focal distance of just under 20 mm. The MFT standard was created by Olympus and Panasonic. Both companies have introduced high-performance commercial cameras that offer a smaller, lighter design, as compared to traditional 35 mm cameras. We offer SVS-Vistek Tracer industrial cameras that use MFT lenses to quickly adjust zoom, focus and aperture. With the exception of C and CS mounts, you should always verify a specific camera's flange focal distance. It is not at all unusual to encounter industrial cameras that have a standard thread, but a non-standard flange focal distance. How many megapixels does a lens need? What determines how much resolution your lens should have? Usually, it is the camera sensor's pixel size. We assume you're purchasing a camera having a certain number of pixels because you need that number of pixels. For example, maybe you're using a camera to measure the dimensions of a part. Based on the size of the part and the measurement precision required, you know you need a camera having about 2300 pixels by 1700 pixels. That's roughly 4 megapixels ("MP"). So would we be safe with a 5 MP lens? It doesn't matter to the lens how many pixels the camera has. What matters is whether the lens has sufficient resolution for each of the camera's pixels to deliver meaningful data. If the lens cannot "resolve" to the size of your camera's pixel, then your system will never achieve the accuracy required. Assuming every pixel is important, a lens must be selected based on the size of a camera's pixels. We can learn a little more by considering two different cameras for the example measurement system mentioned above. We'll compare the CABR106 having 2592 by 1944 pixels 2.2 microns in size, with the CABR883 having 2330 by 1750 pixels 5.5 microns in size. The CABR106 costs a fraction as much and has more pixels, so we explore that first. The CABR106 needs a lens capable of delivering sufficient contrast to its 2.2 micron pixels. (We'll assume for simplicity that we do not need a telecentric lens.) 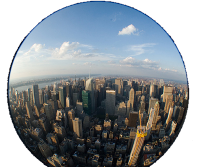 Browsing our catalog, we find the LSKA403 10 MP lens having a stated resolution of 200 lp/mm, or 2.5 microns. That's not quite good enough, but it’s the best we can find. This lens isn't inexpensive; it costs nearly twice as much as the camera. On the other hand, the CABR883 has comparatively large 5.5 micron pixels. We find the LSKA213 1 MP lens offers 120 lp/mm (4.2 micron) resolution, which is more than enough. And the lens only costs a couple hundred dollars. In this example we found that a 5 MP lens for a 4 MP camera was a poor choice. When combined with the CABR106, a 5 MP lens would degrade system performance. When combined with the CABR883, a 5 MP lens might be overkill and cost more than necessary. The megapixel rating may be useful in evaluating relative performance between two lenses from the same manufacturer. But it is of no value in comparing lenses from different manufacturers. And it is of no value in determining whether a specific lens is appropriate for a specific camera. How much resolution you need in the image corners. Resolution is typically specified by manufacturers at image center, where it is best. But data on image corner resolution is typically available too. How much contrast is present in your image? If there is high contrast between the features of interest, you may be able to use a lower performance lens. What image analysis software are you using, and what does it require regarding resolution/contrast? How are lens resolution, contrast, MTF and CTF related? It seems we all have some natural understanding of "resolution" when it comes to cameras and displays. Camera sensors and LCD monitors are divided into pixels, and one way to evaluate resolution is to count the number of pixels a device has. But lenses are made from glass and don't have pixels. So, in some sense, it seems they should have infinite resolution. Unfortunately, that is not the case. When it comes to optics, there is no value in discussing resolution without considering contrast. Consider a camera imaging black and white stripes through a lens. The stripes may be radial, as shown at right. Even if a camera had infinite resolution, there will be less contrast between the stripes as the stripes become narrower. There is no way to decide what resolution is evident in this image without specifying a minimum level of contrast required. Resolution and contrast are intrinsically intertwined. You'll notice the lenses in our catalog specify resolution, without stating contrast. We obtain this information from manufacturers, and it is a simplification based on certain unknown assumptions. The stated resolution is always measured in the center of the field of view. Resolution in the image corners will be inferior, sometimes substantially so. You may notice some lens manufacturers publish a Contrast Transfer Function instead of MTF. CTF is similar to MTF, but uses black and white stripes instead of a sine-wave variation from black to white. CTF is said to assign more favorable results to a lens. Others would argue CTF is more applicable to actual machine vision installations, where edges tend to have sharp contrast. MTF or CTF curves are available for most lenses in our catalog. If there is not a download link on the item's page, please ask us for a copy. How do I choose a focal length? The camera sensor's size. When imaging an object larger than the sensor, using a larger sensor will increase the field of view and/or reduce the working distance. Likewise, in microscopy a smaller sensor will reduce the necessary magnification factor. The working distance. That is, the distance between the lens and the object being imaged. The focal length of your lens. A shorter focal length will image a larger area. Assuming the camera has already been chosen and the working distance has certain constraints, the lens's focal length becomes quite important. Lenses having focal lengths of 8, 12, 16, 25, 35 and 50 mm are commonly available. We offer lenses having shorter focal lengths, but you'll notice that prices increase rapidly below 8 mm. We also offer some lenses having longer focal lengths, typically used to image objects from greater distances. You probably won't find a lens having the perfect focal length. In this case, it is better to adjust the working distance than to use extensions rings. Focal lengths are always specified in millimeters. Shorter focal lengths (about 8 mm and less) result in obvious "fish-eye" distortion, though not necessarily as severe as shown below. Longer focal lengths, and the resulting longer working distances, capture less light. Try out our normal lens, macro lens, and telecentric lens focal length calculators. Ordered by optical format, then focal length. We also offer custom-assembled lenses from Schneider Optics. These lenses are especially ideal for higher resolution cameras. Ordered by optical format, then magnification.